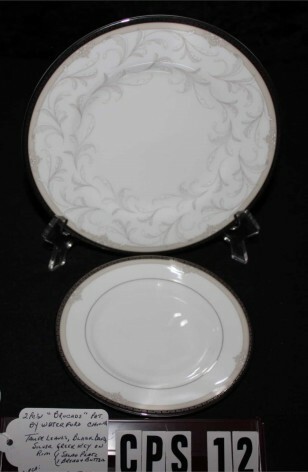 Waterford Fine Bone China in the "Brocade" Pattern WFCBRO, Two Plates, Circa 2002. The Two China Plates for sale today were made by Waterford China in their "Brocade" Pattern #WFCBRO. They are Bright White Plates, with Taupe Leaves on the Lips, Black Band at Rims, with Silver Greek Key Design in the Band. Plates are also Decorated with a verge in Silver. The Two plates consist of 1-Salad or Accent Plate and 1-Bread & Butter or Dessert Plate. Great Serving Items as well. The Two China Plates for sale today were made by Waterford China in their "Brocade" Pattern #WFCBRO. They are Bright White Plates, with Taupe Leaves on the Lips, Black Band at Rims, with Silver Greek Key Design in the Band. Plates are also Decorated with a verge in Silver. The Two plates consist of 1-Salad or Accent Plate and 1-Bread & Butter or Dessert Plate. Great Serving Items as well.. Very Good Resale Condition unless noted below or in pictures.